The fuel monitoring solution is designed for the monitoring fuel consumption, optimisation of fuel costs and prevent fuel theft in any type of objects (mobiles and stationary). Cars, Trucks, Construction Machineries etc. GPS/GPRS tanker module GuardMagic VB8 +Fuel level sensor GuardMagic DLLE1 +Safe barrier GuardMagic JBB01 +"Vehicle Monitoring Service" (or monitoring software). Fuel Storage Tanks, Diesel Generators, Site Tanks etc. GPRS module (GuardMagic FSM or FSL) +Fuel level sensor GuardMagic DLLE series +Safe barrier GuardMagic JBB01 +"Stationary Objects Monitoring Service" . Fuel level sensor GuardMagic DLLE series +Safe barrier GuardMagic JBB01 +SCA adapter (USB-485 adapter) +EasyTank monitoring software. GPS/GPRS fuel trailer module GuardMagic VTS1 +Fuel level sensor GuardMagic DLLE1 +Safe barrier GuardMagic JBB01 +"Vehicle Monitoring Service" (or monitoring software). GPRS module (GuardMagic FSM or FSL) +Fuel level sensor GuardMagic DLLS series +"Stationary Objects Monitoring Service"
GPS/GPRS module GuardMagic VB7 +Fuel level sensor GuardMagic DLLS1 +"Vehicle Monitoring Service" (or monitoring software). GPS/GPRS module GuardMagic VTS6 +Fuel level sensor GuardMagic DLLE1ct +"Vehicle Monitoring Service" (or monitoring software). GPRS module (GuardMagic FSM2 or FSM3) +Fuel level sensor GuardMagic DLLE series +Safe barrier GuardMagic JBB01 +"Stationary Objects Monitoring Service" . 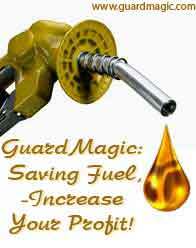 GuardMagic fuel monitoring system in a full automatically mode, "day & night" collects and stores detailed information about fuel tank contents and fuel usage. "On-Line" (Real Time) Remote Fuel Monitoring - for mobile and stationary objects remote fuel monitoring. Special GSM modules (special GSM fuel controller) transmit the fuel information in a fuel tank to central station by GSM network.